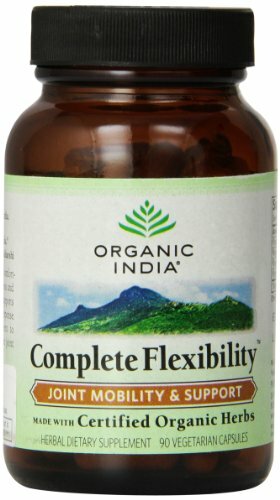 Discover a flexible, active and happy you with Organic India's Complete Flexibility all-natural formula for joint pain and muscle aches. This blend of 100% USDA-Certified Organic herbs and roots nourishes joints and muscles, easing mobility and allowing you to find that flexibility you once enjoyed. A unique combination of Cyperus rotundas, Withania somnifera, Tinospora cordifolia, Ocimum sanctum works to promote better, more fluid and pain-free movement. Find healthy joints and muscles, and the active lifestyle you want for yourself, with the help of Organic India's Complete Flexibility formula made with soothing Turmeric. If you have any questions about this product by ORGANIC INDIA, contact us by completing and submitting the form below. If you are looking for a specif part number, please include it with your message.